I had to make two trips to the zoo to get a shot of this octopus spread out on the aquarium glass. He (she?) preferred to stay curled up in the corner, so I only had a couple of seconds to grab a shot. Great detail & focus - especially difficult through glass. Nice job & congrats on your PB! Great subject for this challenge! A tad bright in the center, but I love the tones and lines of this shot. Well done! way cool, how did you capture? this under water? Great capture! Detail is amazing. great shot! i wonder what it would look like more cropped to all the little suckers. A good shot of the underside of an octopus - one of which we get to see all the cicular shaped suckers. 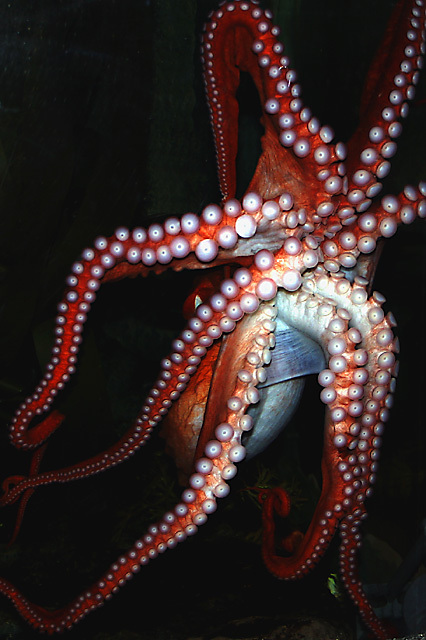 The red hue of the octopus also offers a splash of vibrant color to the scene. My critique on this piece is that the image would be visually strenthened if the viewer could see more of the head and eye of this creature - not only would it more readily identify the octopus but it would add more shapes to the composition- oval for the head and another circle which would be the eye. Proudly hosted by Sargasso Networks. Current Server Time: 04/26/2019 07:41:36 AM EDT.